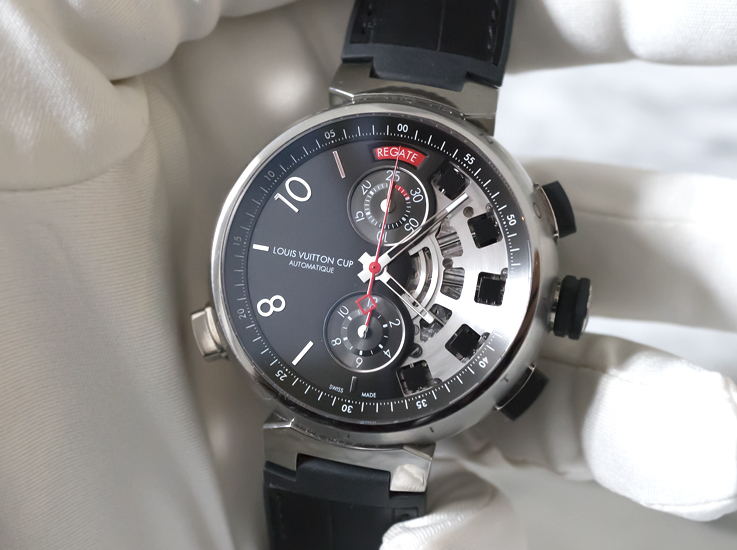 Louis Vuitton, who has always worked with the best designers for their various product lines, continues the tradition, with the development of their collection of timepieces. The watches, that were described in Part 1, arose from a collaboration with Gae Aulenti and IWC, were just the beginning. Much more was needed to break into the world of high-end watchmaking. In 2009, Louis Vuitton named ​​Hamdi Chatti as Vice President of the new Watches & Jewelry department. Mr. Chatti, who had more than earned his spurs in the watch world, (he worked previously for Piaget, Harry Winston and Cartier) realised that he could only achieve his goal if he had the whole production process in one hand from the first sketch to the final product. Exactly two years ago, Chatti had to take decisive action, which resulted in the complete buyout of dial maker ‘Léman Cadrans’ and the independent watch atelier ‘La Fabrique du Temps’! 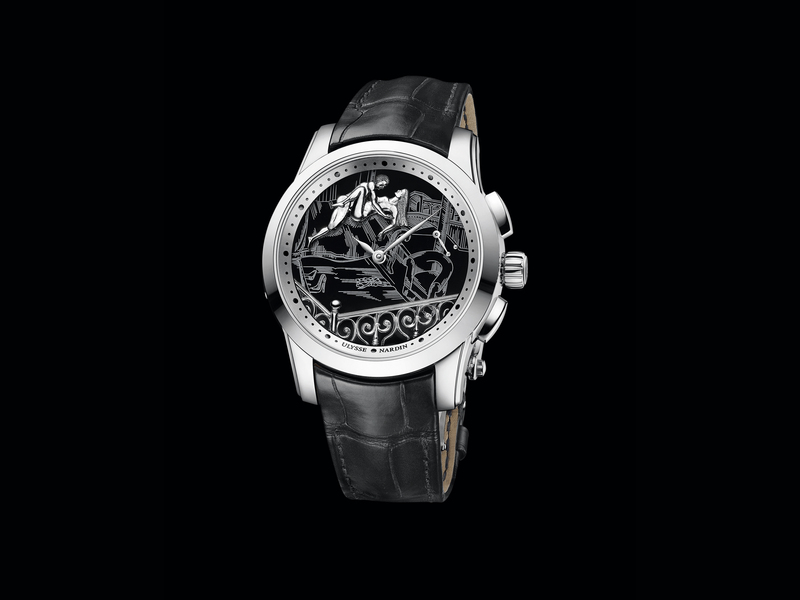 ‘La Fabrique du Temps’ was set up by the two Masters of Watchmaking, Michael Navas and Enrico Barbasini – two highly-experienced men who had worked for Gerald Genta, Patek Philippe and Audemars Piguet, created master pieces for Franck Muller and are highly respected for their current work atLaurent Ferrier. From Summer 2014, all Louis Vuitton watchmaking activities will eventually be housed under one roof; the brand new factory ‘La Fabrique du Temps Louis Vuitton’ in Meyrin, (a municipality of the Canton of Geneva), will then be reality. 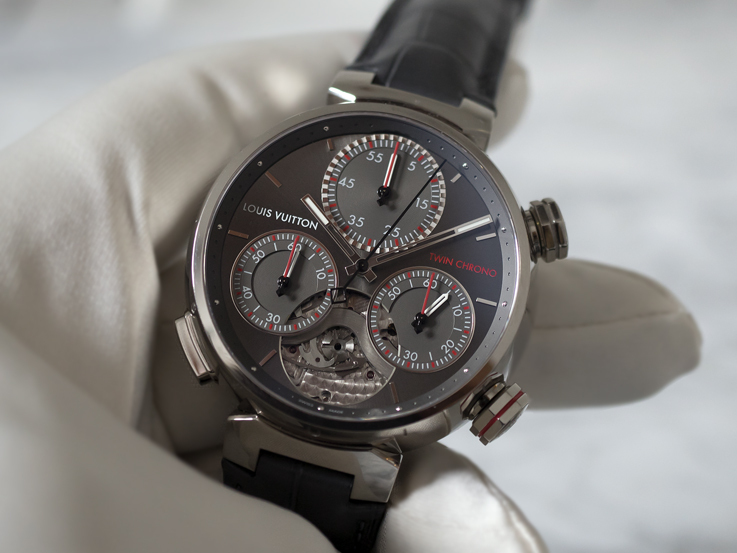 At Baselworld 2014, Louis Vuitton presented an impressive collection of new watches and, for now, I would like to zoom in on the five new High End pieces of the collection. 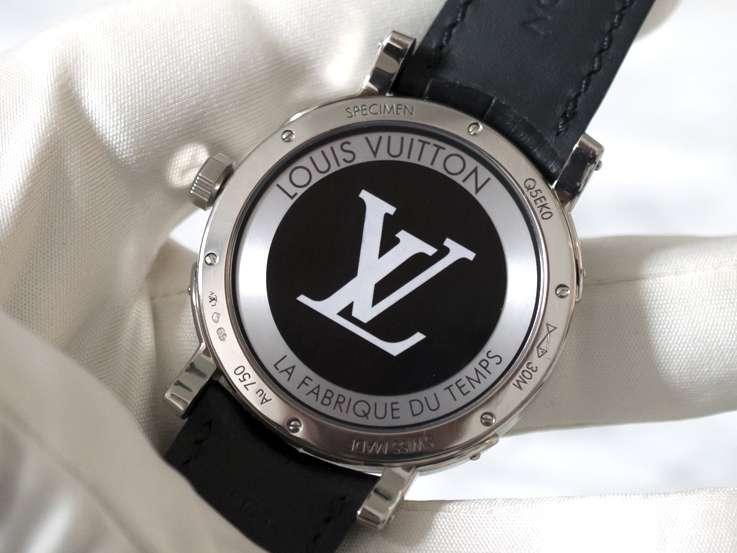 In every aspect, the ‘Escale World Time’ is the show-stopper of the Louis Vuitton collection. This timepiece perpetuates the tradition of travel and draws on the history of the company to reinvent the distinctive features of the travel watch, specifically their own travel-watch, the Louis Vuitton 1 (1988). And what a reinvent it is! 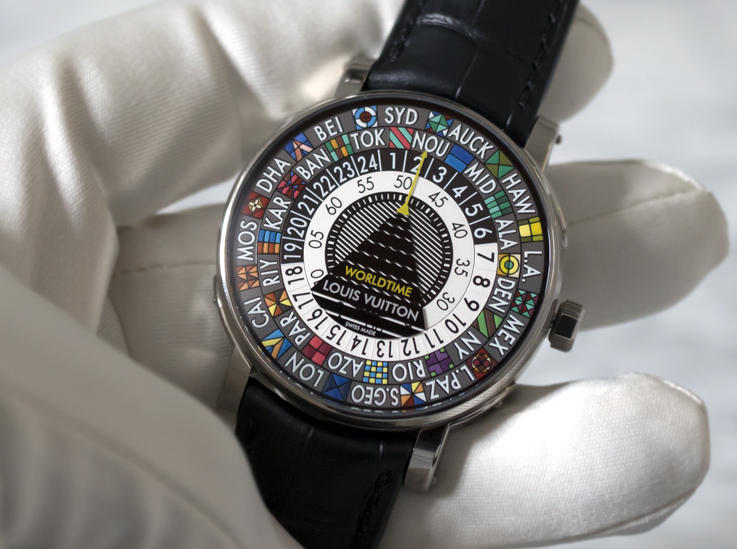 Most travel watches on the market, are traditional-looking two or three hand watches (nothing wrong with that) and in that respect, Vuitton has created something new and unique: a Worldtimer without hands, where all functions are being done over the crown! At first sight it may look quite busy and difficult, but the contrary is true. To set the watch, the crown needs to pulled out to the first stop. Now the desired city can be lined up with the yellow line with arrow. Then, the crown is pulled further to set the time. I set the watch to 6 minutes past 2 and that’s all. In just one glance, one can see the time of the chosen city and also in all cities over the world. 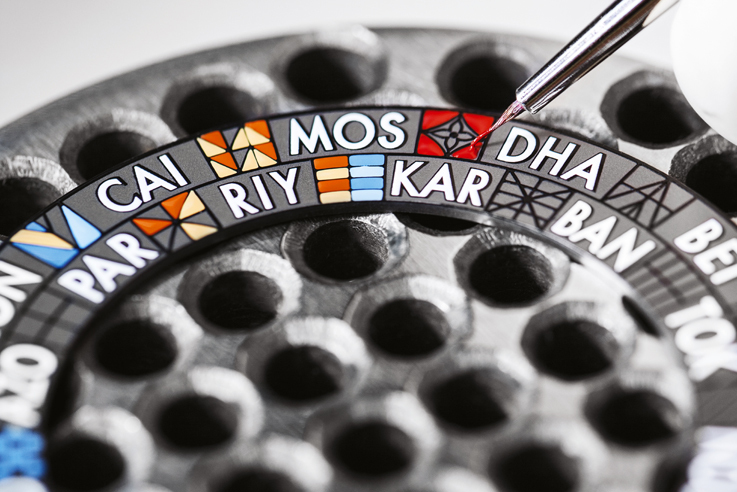 The dial of the watch is completely hand painted, takes 50 hours to complete and is done in ‘La Manufacture du Temps’. The dial discs themselves rotate under the black triangle and yellow arrow. These are applied directly underneath the glass, to prevent them from restricting the movement of the mobile discs. Almost as sensational as the ‘Escale World Time’ watch is the new case that Vuitton developed. Creating a new case is always, for any brand, an immensely difficult job. 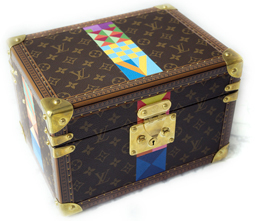 Coming up with a new round case that is different and still encapsulates the essence of Louis Vuitton deserves applause. 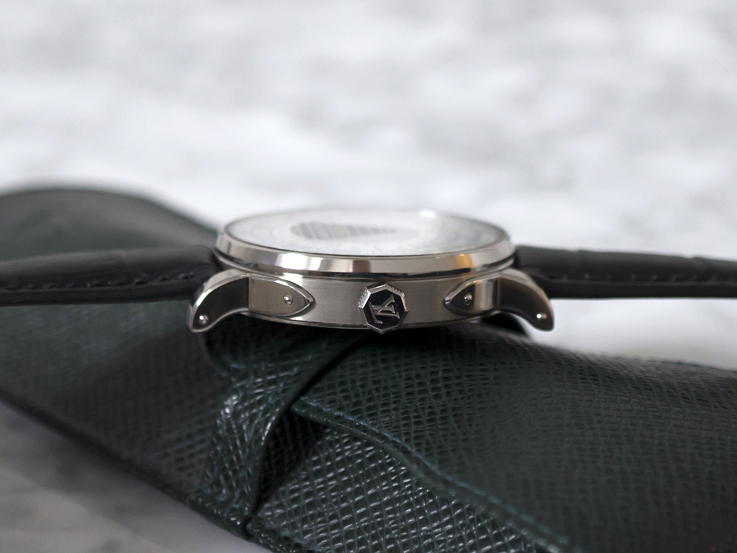 The 41mm white gold case has a very classic look and a lug construction that resembles the old round trunks. While the original Tambour case has quite some height, the new case is pretty flat and measures only 9.75mm. I am sure the new case will find its way in the collection, and I hope it will also be used for dressier and simpler watches. The back of the timepiece is also quite unusual. A sapphire back reveals an aluminium disc coupled with an oscillating weight, which rotates around a large LV in frosted glass. It looks very clean and certainly matches the style of the front of the watch. I would, however, have preferred to see a more traditional rotor, instead of the strong LV branding. But that is actually my only gripe about this sensational watch. The Escale World Time watch will be delivered in a hand-made, typical Louis Vuitton case, with brass corners and locks, covered with the traditional LV canvas and beautiful hand painted illustrations. See below for a video that we did at Baselworld on this unique watch. ‘The Tambour Twin Chrono Grand Sport’ gives a new view on chronograph watches and it is the first watch that is able to time two competitors separately and show their individual timings along with the difference between the two. 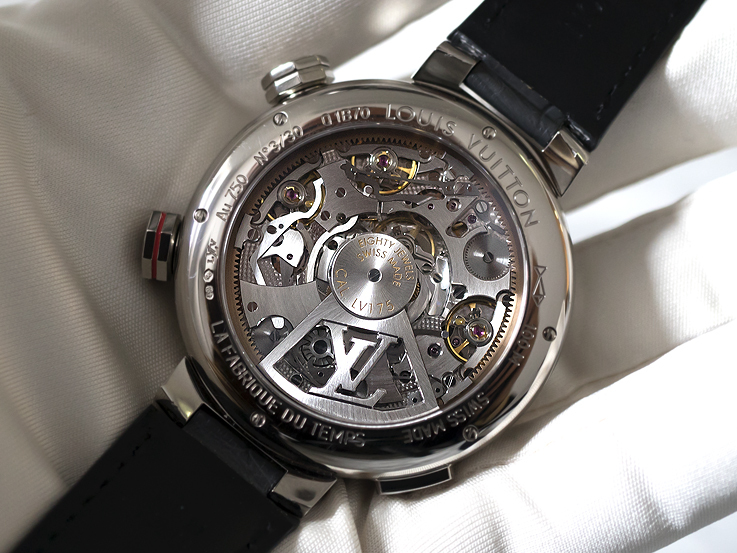 For this dual chronograph, ‘La Fabrique du Temps Louis Vuitton’ created the new automatic caliber called the LV175. 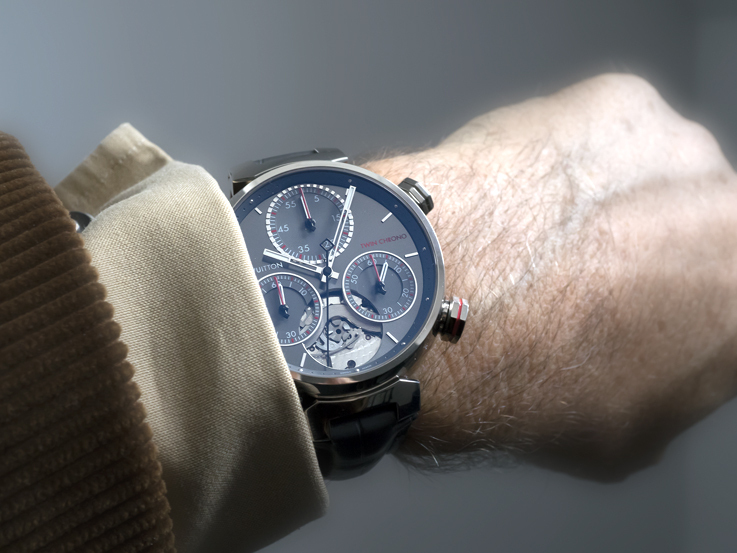 The concept of this chronograph is an important innovation and a major step in the history of the chronograph watch. One of the greatest achievements by the watchmakers was to ensure the perfect synchronisation of all these movements, that sometimes stop and start simultaneously. When one realises that much more components are needed to build this watch than to manufacture, for instance, a minute repeater, it becomes clear that it will be almost impossible to attempt to explain everything about this caliber in this brief article. That’s why I’d rather explain the working of the watch. Louis Vuitton actually kept it very simple. All timing functions are operated by the push button at the eight o’clock position. For instance when a race begins, the mono pusher is pressed to start the timing on the lower two counters. As soon as the first runner passes the finish, the same button is pressed again. His score is now displayed at the counter at the eight o’clock position. The hands are frozen now. In the mean time the counter the four o’clock position still continues and the timing at the counter at the 12 o’clock position begins. When the second runner crosses the finish, the mono pusher at the eight o’clock is pressed again for the third time and his score will then be displayed at the counter the four o’clock position. Now the counter at the 12 o’clock will display the difference, in minutes and seconds, between the two runners. And to start a new timing, just push the mono pusher at the eight o’clock position for the fourth time to set all counters back to zero. Since sport events are always very hectic, hence requiring quick action on the spectator’s part, timing needs to be kept as simple as possible. The same button is used for all timings, hence making it incredibly convenient. The up-to-100-meter water proof ‘Tambour Twin Chrono Grand Sport’ will be produced in a 45,5 mm white gold in a limited edition of just 30 pieces. ‘The Tambour éVolution Tourbillon Volant’ is quite a departure from Louis Vuitton’s first tourbillon watch, the ‘Tambour Tourbillon Monogram’ (still part of the collection), that is equipped with the mechanical hand wound caliber LV103 by La Joux-Perret. 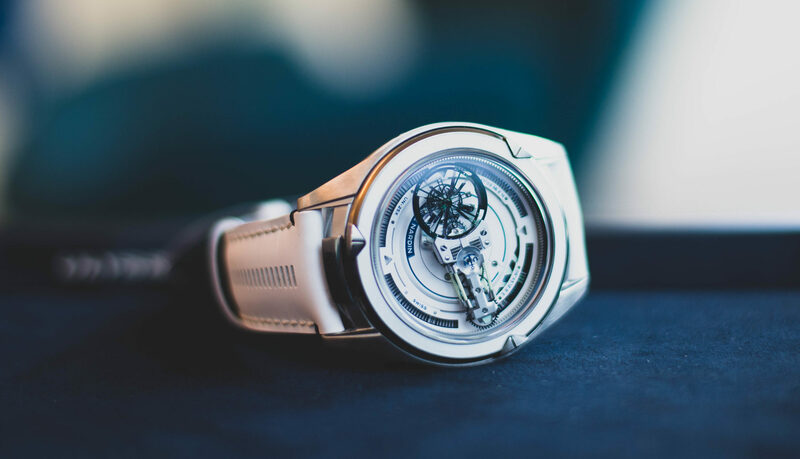 The new éVolution is powered with the first automatic calibre with a flying tourbillon, developed and assembled in the workshops of the La Fabrique du Temps Louis Vuitton Manufacture. The opening in the dial shows the flying tourbillon, that’s performing one revolution per minute, bearing the large “V”, which serves to indicate the seconds. The “V” motif was invented by Gaston Vuitton in 1901, to adorn his famous Steamer Bag. The historical “V” symbol had since become increasingly important in the collection and has found its way to other Vuitton collections. The case measures 43mm and has a pink gold bezel, horns and crown, with a ceramic middle. The Tambour éVolution Tourbillon Volant comes on a pink gold bracelet. And in contrary to the earlier Tambour Tourbillon Monogram, the dial is kept as clean as possible and produced in house, by the ‘Louis Vuitton Léman Cadran’ workshop. ‘The Tambour Spin Time’ collection, with the rotating cubes, dates back to 2010. 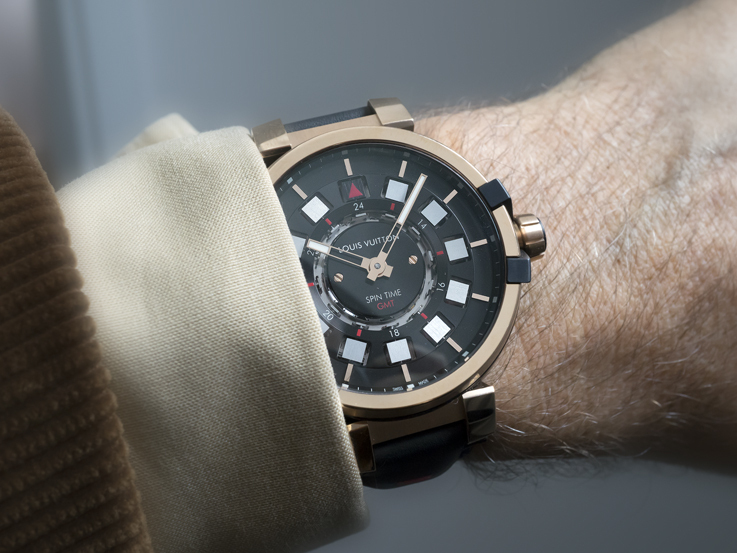 This time, the watchmakers of ‘La Fabrique du Temps, Louis Vuitton’ created a new model dedicated to the regattas and called it the ‘Tambour Spin Time Regatta’ following the white gold and pink gold models, that were launched in 2012 and 2013 respectively. 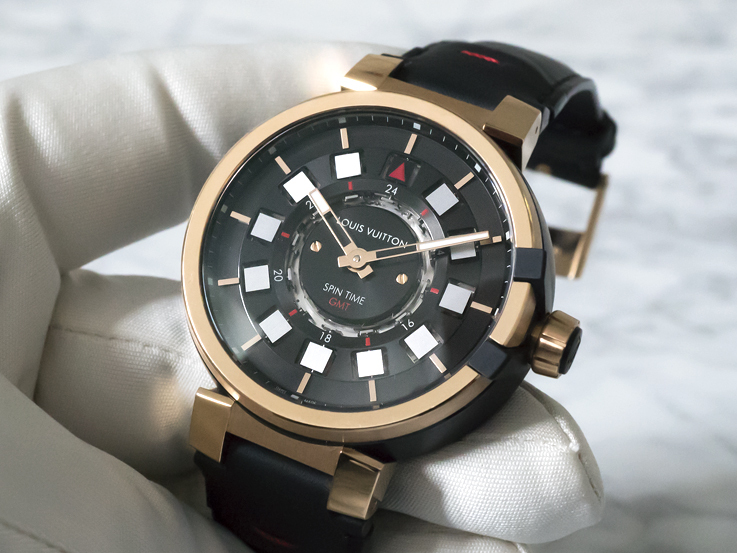 This year, Louis Vuitton presented the new creation, the ‘Tambour Spin Time Regatta’, in a titanium case. For the brand, this is their first titanium watch. 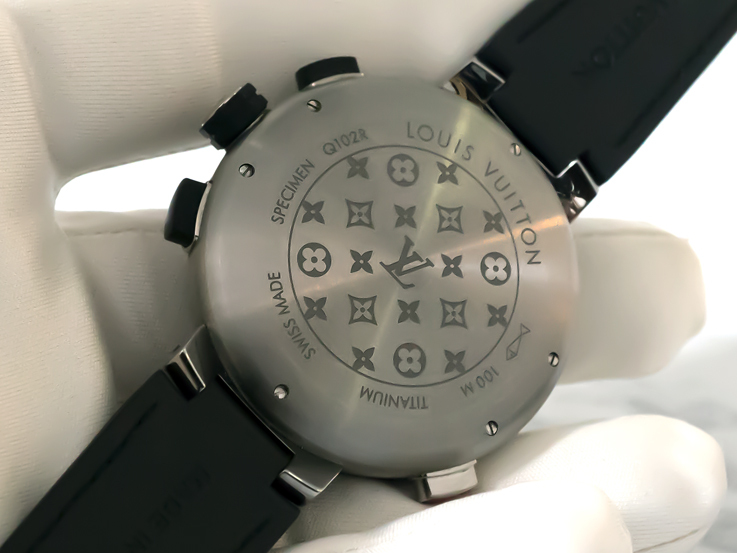 The closed back of the 45,5mm case, reveals the engraved LV pattern and the buttons are molded with a rubber layer. The feel of the watch is light and very comfortable, making it ideal for outdoor donning. Even the strap is made for sports or warm climates and features a top of alligator leather and rubber on the inside. The automatic LV156 caliber has a water resistance of 100m and features a chronograph and regatta 5-minute countdown which is visually indicated on the dial by 5 rotating cubes. Following the new America’s Cup rules of a regatta start in 5-minutes, the Spin Time Regatta allows the skippers and crew to position themselves in the best possible way: on the starting line during the 5-minute countdown. At the same time, the chronograph’s 30-minute counter will leap rightward and move to the 5-minute countdown displayed in red in the counter. This way, the minutes before departure are taken into account in the final measured time. 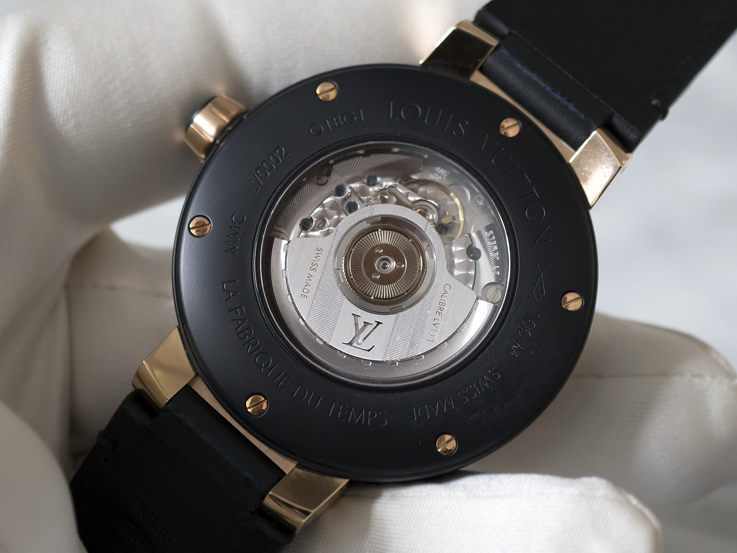 The Spin Time movement LV111, that was developed and assembled by the watchmakers of ‘La Fabrique du Temps Louis Vuitton’ and patented in 2010, displays the time via rotating cubes. The working and adjusting of the watch are very user-friendly and the reading is excellent. The automatic movement works just like a jumping hour where the cubes, that indicate the hour in the other time zone, jump every hour. In merely a twelfth of a turn, the movement moves a disc equipped with appendices. The latter act on the Maltese crosses riveted to the axes of the aluminium cubes, rotating two of the twelve cubes by a quarter turn. The first presents a satin-finish face where it previously displayed an arrow, and the other, which cube face had a satin-finish a few moments beforehand, presents an arrow pointing outwards to indicate the hours from 01:00 to 12:59 or an arrow pointing inwards to display those from 13:00 to 00:59. Louis Vuitton, being a name almost synonymous with travel, created with this eVolution Spin Time not only the ultimate travel watch but also one of the most creative GMT time pieces. Little by little, the watch collection becomes stronger every year and since the two Masters of Watchmaking Michael Navas and Enrico Barbasini, joined the team at Louis Vuitton, the collection of ‘Mainstream’ watches has been transformed into a collection of ‘Mainstream & High-End’ time pieces. This is a great development that has slowly built Louis Vuitton up into a very worthy competitor in the watchmaking scene. Just like every other Louis Vuitton product, the timepiece collection is only available through their own network of Boutiques and in the Louis Vuitton Watch & Jewelry Stores. I would like to thank Mr Hamdi Chatti and his staff, for his time and for giving me the opportunity to photograph my choice of watches from the new collection.